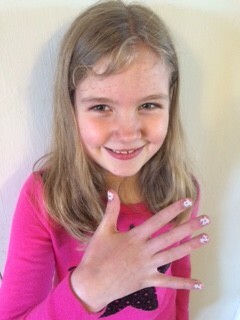 My sister just started a Jamberry nails business, and she wanted some input from the seven-year-old crowd, so she sent some nails to DC and asked her to review them. So without further ado, I present you with DC’s review of Jamberries. Enjoy! Jamberry nails are stickers. They’re like these stickers that you put on you, but you’re putting them on your nails. You have to put them by somewhere warm, and you have to cut them in half so they fit you. You put them on instead of nail polish. When it’s done, it looks pretty. I got cherries and stripes. After a while when they’re kind of banged up, they might come off. But they might not. And don’t try to peel the stickers off, because they will come off. My friends use them too, and if you need any more help, you can look on Youtube for how to put on Jamberries, and then they’ll tell you to. I think they’re good to wear anytime. There are lots of different patterns, and just choose them and hopefully you’ll be happy with them. On a scale of 1 to 10, I would give them a 10. I really liked them. And that’s all you need to know for Jamberries! There you go, folks. I think that’s the longest thing she’s dictated to me. It was a fun thing for her and Denisa to do, and DC really enjoyed it. If you want to find out more, go check out my sister’s storefront online. Kirkus Reviews The Memory Thief!